We’re camera shy, he and I. Just another among a thousand things we have in common. Sometimes I forget all the things on that long list. There are days when it feels like we have little in common, because we know each other too well and the big things get obscured by the squally details of getting through the day. He puts the drinking glasses here; I prefer them there. I like to plan the route before the trip; he prefers to wing it. He leaves his shoes where I don’t expect them to be. I recycle bottles he’s saving to put cider in. But, honestly, even while I’m trying to think up a list of those differences, I’m coming up nearly empty. Because I’ve stepped back a foot or two, and the pointillism of our lives has resolved itself into a whole, beautiful painting. All the big things? We match perfectly. We bicker like any two people who have hung around together for 20-odd years, but down deep, we’re a pair and I don’t know how I’d muddle through the days, nights, weeks, and years without him. He makes me laugh. He makes me mad. He tells me things I never knew (he does this daily). He cooks us delicious feasts. He trims goat hooves. He cuddles the cat I don’t like. 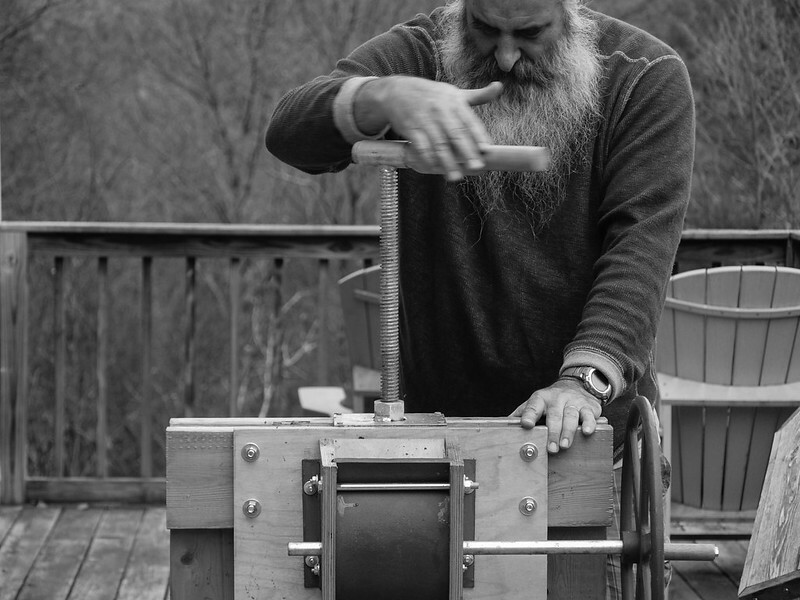 He presses apples for hours on a brittle October afternoon, while the world feels like it’s going to heck. He believes in things, and stands by his beliefs. He’s a terrific father to H. He knows poems by heart. He loves his family. And staring off into the hills, thinking and watching and listening. He makes me a better person, every day. Just by being. And, really, I’d be utterly lost without him. Besides being an inspiring description it is an awesom tribute to H’s Dad! The photo says a lot. Um, since I’m the only male who appears to feel compelled to comment, I considered being all manly and say something in jest. Truth is, this was great R. You’re lucky to have him. He’s lucky to have you. You’re both luck to have H.